With those horrible snowy pics I posted yesterday, I had to switch it up with a sunnier look! I totally wore them both last week!There was no real yellow in my closet until this month. I have a mustard cardigan and top, but nothing fun and bright. At $10 I took a chance on this with a recent Old Navy order and was pleasantly surprised by the weight of the material and its cuteness! The different colored stripes won me over. I even went all out and paired it with cobalt! It's so nice that most days are warm enough for flats now. I debated getting these for a few weeks and then debated returning them. I have navy flats with a white buckle that could work similarly in outfits, but after all those days, I still wanted them! They certainly don't fill any holes in my closet, but they are fun and a lot more comfortable than I thought! I've already worn them a few different ways and think the overall cost per wear will justify them! Ooh I've seen these Gap flats before and have loved them. I think they were a good buy. They are so cute! Really like your first outfit too - the yellow stripes are so nice! I don't own much yellow, but I always admire it on other people. OMG get out of here. You are wearing 4 pieces (from both outfits) that I am dying to buy/own RIGHT NOW. Both of your necklaces, some B+W Striped Smoking Flats and a Military Vest. I know I have said it before but this is MY MOST FAVORITE TWOFER TUESDAY POST, yet. I love both of those Outfits head to toe and pinned them. A Knockout my friend! A Knock-out!! officially adding striped flats to my wishlist! You are totally looking like spring in both of these outfits :) And those flats are def. a great purchase--totally loving them! It so hard to turn down a fun pair of shoe. I love your second outfit. Those shoes are SO CUTE! I might have to get myself a pair! 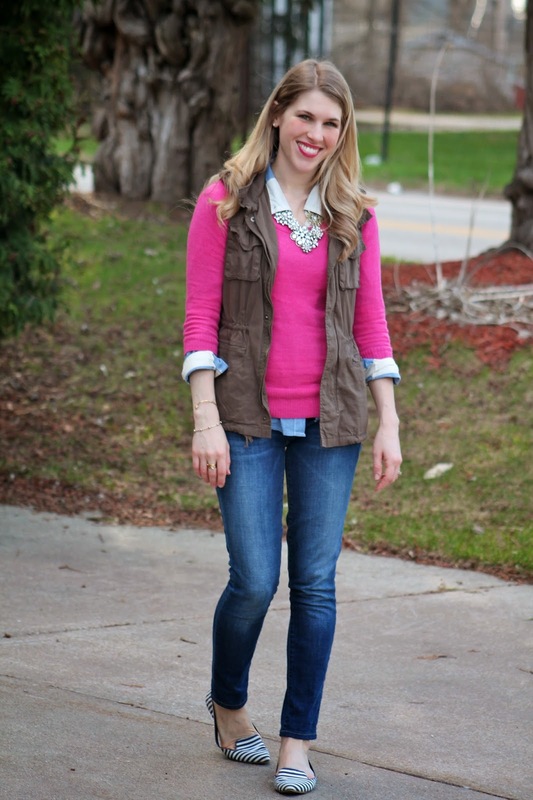 Love these looks- especially the pink/cargo vest combo. 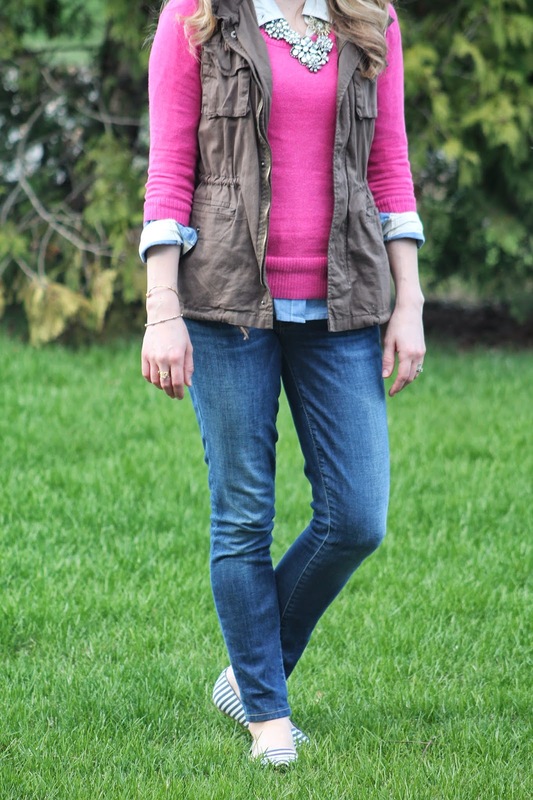 The layering and the colors-- super cute! I'm so bummed that the size 6 was too small and the size 7 was too big for me! They need to stock half sizes! I really wish they would too! The size 8 is a bit big for me, but at least they are wearable. 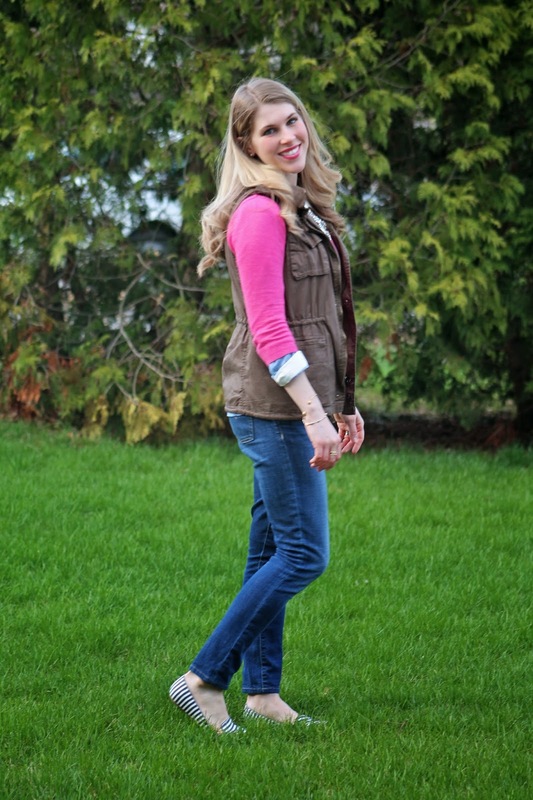 LOVE those bright blue skinnies, babe! You look smashing! I've worn almost an each dup of the second look, great minds, think alike :) love the flats with it, so cute! Both of these looks are so cute! I love the "stripe mixing" in the first one. That shade of yellow is so pretty, I might have to buy that same shirt! The second look definitely demonstrates your layering expertise--I never look as cute as you when I try to layer! I love that pink sweater in your second outfit - what a fun, bright shade! !